Weekly Round-Up #205: Easy Christmas Cards, Productivity Boosting Extensions And Do You Feel Lucky Punk? Welcome to this week’s round-up. If you have a sense of Déjà with this week’d round-up number you’re not going mad, I numbered last week’s round-up incorrectly – whoops! 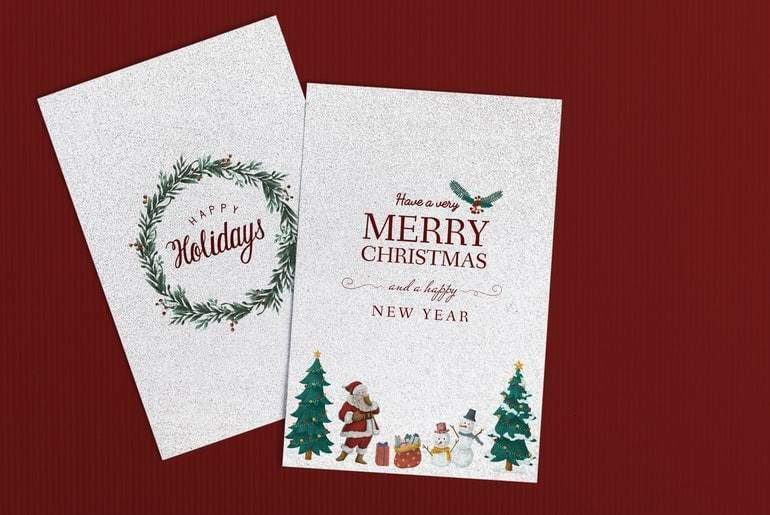 This week we take a look how you can send Christmas Cards to friends, family, customers and employees without opting for e-cards or getting cramp in your hand from writing hundreds of cards. We also take a look at some Google Chrome extensions that can increase your productivity and whether you can make your own luck just by believing in it. I don’t know about you but I do like to receive Christmas Cards through the post – eCards from companies can come flooding it at this time of year and seem a little impersonal. But, if the thought of sitting down and addressing a load of cards by hand has you in a cold sweat, fear not! This article from Zapier has 6 companies that will do all the hard work for you! You wouldn’t think that some big-named companies would still be able to operate in this day and age if they were losing money, but as this graphic shows even some of the biggest companies may not be as buoyant as we think – I mean Tesla’s losing $2bn and can still send a car into orbit? Wow! Some might find it ironic that I’m using a chrome extension to help me write this article – I just call it being cleverly productive! Whether you want to sort your email out or collaborate with others more efficiently there’s a chrome extension that can help you up your game. Customer service is a massive selling point in any business – upset one customer and thanks to social media they can take hundreds more away from you. In this article Expandly looks at the importance of customer service and how you can manage it effectively. Think you’re not superstitious? I bet you are without even thinking about it! Avoiding walking under ladders, touching wood, crossing your fingers – sound familiar? I must admit I do all these but I’m not sure if it’s superstition or more cultural repetition. Still, it’s better to be safe than sorry, right?! Sticking with customer service, 81% of Americans report that businesses are either meeting or exceeding expectations when it comes to customer service and that companies are getting better at dealing with their needs. In this article Nextiva gives us an interesting breakdown of how customer service is working, what they expect and what you’ll need to do in the future to stay ahead of the game. If you’re thinking of going in for a website redesign soon then you’ll want to pay close attention to the colour you choose for the various elements on your site. Something as simple as a colour can have a big impact on how your customers interact with your site and whether they’ll end up purchasing something. With Christmas just around the corner it’s now coming to the the time of the office party. Some of you may love the idea of free food and booze, others may be dreading having to socialise with others in a non-work setting. Personally I liked to be the sober observer just taking in all the stuff that the “prim and propers” in the office got up to after a couple of dry martinis. Anyway, I digress! I would highly recommend taking part in any social event just for the comedy value if nothing else! Looking for somewhere romantic to tie the knot? While it might be too late for this year (and we can’t guarantee a white Christmas anyway) there are some fantastic looking wedding venues in this article and some are under an hour from me so I guess I’m going for a little drive around soon! With Christmas coming up, you’ll probably be doing a lot of cooking, and this causes a lot of extra washing up. Don’t think about firing up the dishwasher though – apparently washing dishes is a great stress reliever so tell that to your partner who refuses to do any! I don’t think anyone is truly irreplaceable – I and I say that as someone who was made redundant and would like to think I went “above and beyond” at my previous employers. That being said, you can make sure you’re at the bottom of the redundancy queue by implementing these tips. If you’re taking time off over the holidays then your email inbox can become a bit unruly so get some systems in place to make it easier to manage when you get back. After doing some research for last week's round up I discovered that Millennials will have a minimum of 12 jobs. Do they deserve to give you advice based on limited experience in different fields? I don't think so! Here’s a bit of Friday humour for you! Since reading this article I have cut back on my use of “as per my previous email” – however I think it’s tone was already lost on the recipient! Which of the phrases are you guilty of using? Let us know in the comments.